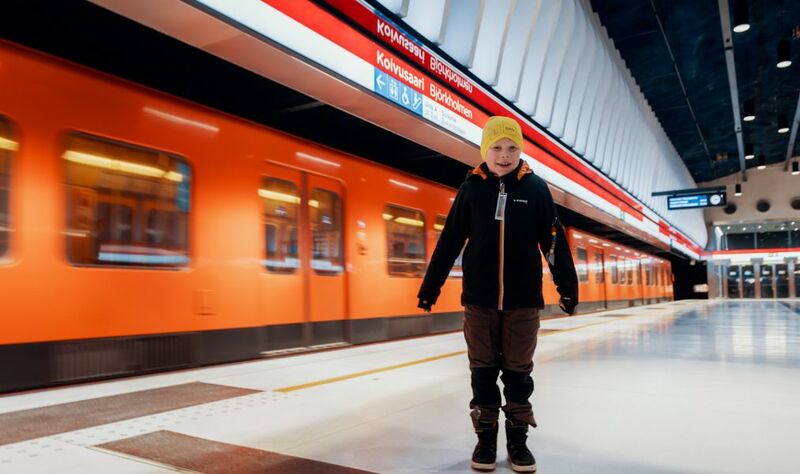 Eight-year-old Urho, who lives next to the Koivusaari metro station in Espoo, was able to follow the construction work on the station from the very start, directly from the windows of his home. At first, the blasting work on the site scared the small boy now and then. So Site Manager Reima Liikamaa and Area Manager Jussi Lahti paid him a visit and presented Urho with his personal site helmet and ear protectors. This was the beginning of good cooperation, and close contacts were maintained throughout the time of construction. In this challenging project, construction took place 30 metres below sea level and to a tight schedule. SRV’s Koivusaari metro station deservedly won the Construction Site of the Year award in 2015. Maintaining good neighbourly relations also played an important role. “Having a construction site only a few metres way certainly tested the residents’ nerves, but with SRV issues were always handled in an exemplary way. We received the very best service,” says Urho’s father, Kari, with satisfaction. At the end of the interview, everyone wants to know, of course, whether the Koivusaari project kindled some kind of spark in Urho for the construction industry? “When I grow up, I want to be a workman, a cook and an icebreaker,” lists Urho with a smile, placing the site helmet on his head.